Vermilion Peak is a CO 13er and P2K in the San Juan Mtns, lying roughly halfway between Hwy145 and US550. It is the highest in a group of more than half a dozen high 13ers that surrounds picturesque Ice Lake Basin, one of the most popular alpine basins in the range. It can be reached from the South Mineral TH about six miles due west of Silverton. I had driven the five miles of good dirt/gravel road along the South Fork of Mineral Creek the night before, camping roadside at a small turnout that was suitably flat. There is some free, scattered USFS camping to be found along the side of the road facing the creek, all of it appearing to be occupied as I drove in. The pay campground at the end of the road was also full, though it is doubtful I would have stayed there. There's just no getting around that this area is hugely popular and not the sort of place one goes for solitude. My plan was to hike a large loop of the area, climbing a handful of peaks that included Vermilion and descending at the end of the day through Ice Lake Basin. In the morning I drove the short distance to the South Mineral TH and parked the car in the day use lot there. Rather than follow the main trail leading to Ice Lake Basin, I followed the 4WD route southwest past the campground for several miles. The sun had risen shortly before I started out at 6:30a and I enjoyed the fine views of the surrounding summits, having the road to myself in the early morning. Rolling Mtn rises at the south end of the drainage above South Park, another popular camping area. The route forks here, with one continuing straight through South Park as the Rico-Silverton Trail, another turning west to go over a high pass to the headwaters of the Lake Fork of the San Miguel River. It was to this pass I was headed, but I had some trouble locating the trail fork. I turned west near some mine tailings that proved to be a little too early. Some minor cross-country after my spur road ended led me down through some forest where I soon picked up the well-defined trail I had been looking for. I followed this up through some lovely alpine terrain above treeline, framed by V9 which rises to the south of the pass. This would be a nice summit to combine with Rolling Mtn and perhaps Twin Sisters in a large loop around the south side of the drainage, but that would have to wait for some future project. I reached the unnamed pass at 8:30a, the lovely Lake Hope visible half a mile away, nestled at the base of San Miguel Mtn on its NE side. I turned northeast as my route would now follow the crest up from the pass, tagging the various summits along the way. First up was unnamed Peak 13,300ft, a pile of loose boulders and choss that could not really be described as fun by any reasonable definition. A ducked use trail starting up from the pass dashed any hopes that it might be easier than it looks when it ended rather abruptly less than ten minutes after starting up. I spent most of the next hour making my way up the Southwest Ridge where I was at least rewarded with some nice views that would only get better as I reached each successively higher summit. In addition to a good view of Rolling Mtn to the south, there is a far-reaching view west to Trout Lake along CO Hwy145 with the Wilson 14er group in the distance. To the north stretched the continuing ridgeline to Beattie Peak with Vermilion and Fuller behind it. I found no register on this first summit. The next 45min were spent getting from Peak 13,300ft to Beattie along the connecting ridge about 2/3mi away. The rock quality didn't improve but the elevation gain was modest, allowing good progress along the route without much trouble. Reaching Beattie's summit shortly after 10a, I found a poorly designed PVC container holding a uselessly soaked and unreadable register. "Poorly designed" and "PVC" are somewhat redundant, as they seem perfectly made for allowing water in but not venting it out. Neither the register nor the PVC contraption that held it would be left at the summit upon my departure. 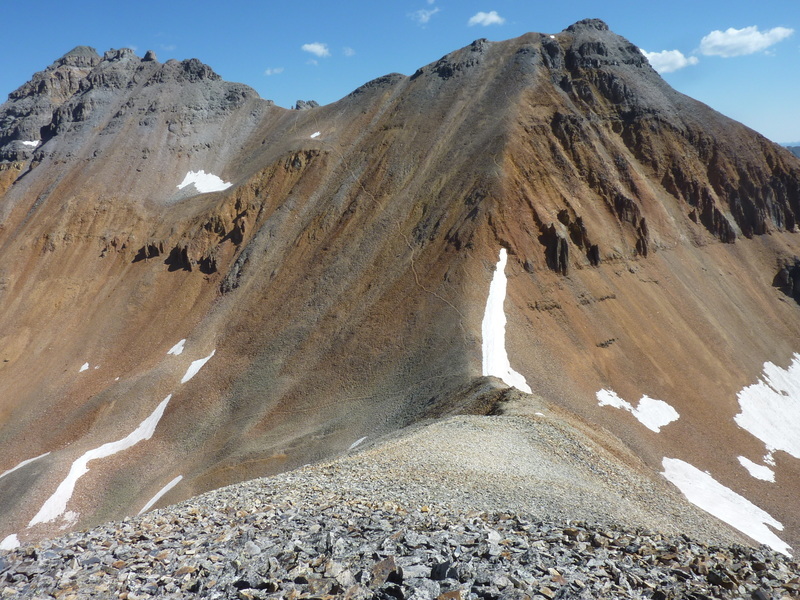 I turned north to drop down to the saddle with Fuller Peak, surprised and happy to find a use trail not only heading down from Beattie through the talus, but also rising up across the saddle to the much higher saddle between Vermilion and Fuller. It appears the more common route to Vermilion from the south comes by way of this lower saddle from the west. I could see a lone figure making his way down towards Lake Hope as I was descending, the only person I would see until I was down in Ice Lake Basin later in the afternoon. As I was approaching the lower saddle I could see two possible routes up the north side. A well-defined use trail cut a path through the steep talus up and to the left while a poorer trail went more directly up the ridge to Fuller. Since I couldn't tell if this weaker trail continued the whole way, I opted for the surer, but longer traversing route. This proved perfectly acceptable, taking but 30min between the lower and upper saddle, then another 15min east along the ridge to Fuller's summit, no more than class 2. I got my first view into Ice Lake Basin along the way, the uppermost part of the drainage looking to be a collection of unpleasant morainal talus and rock. Further down, around Ice Lake, was the more pleasant-looking, green alpine wonderland that earned its reputation. From the summit one can take in a sweeping view of the South Mineral Creek drainage to the east and a somewhat imposing view of Vermilion to the west. After returning to the high saddle, I expected to have some difficulties reaching Vermilion, but found none. There is a well-worn use trail through the rock on the south side of the crest with the hardest moves being easy class 3 and it took but 30min from Fuller's to Vermilion's summit. A dry CMC register was found here, not dating back more than a few years. I find it humorous that the pages are all ruled and subdivided with places for date, name, city, state and comment, the latter with no more room reserved than for name or city. Obviously done to minimize wasting space, it kinda sterilizes the register experience, and in the end it seems they get removed before the ink has dried long, usually just a few years, well before space becomes an issue. As one might expect from a P2K, the views were grand in all directions, the San Juans stretching out almost as far as one can see to any compass point. I studied the route north to the next peak in line, Golden Horn, as it was the next candidate along the traverse of the crest. I had not expected to get to Vermilion as early as I did, originally planning to end my summit tour here. Had I done further research, I'd have found that the continuing route would have gone nicely at class 3, but from eyeballing it, things looked more difficult and I wasn't sure I'd be able to get down from Golden Horn through a cliff band on the east side between the two peaks. I decided to play it safe and go with the original plan, returning via the use trail to the Vermilion-Fuller saddle and from there down the north side to Ice Lake Basin. I was able to avoid late season snow that lingers on the north side of the saddle, skirting its edge on the west side and descending steep scree slopes about 500ft to easier terrain below. Lower down, some snow in the drainage made the going a little easier, helping me reach the unnamed lake at 12,660ft. Some rail tracks and other mining debris near the lake told of its past mining history. Below this lake I picked up a ducked use trail that descended what was now becoming a lovely green alpine carpet leading down to Upper Ice Lake Basin. A sleepy marmot here had trouble deciding if I was a threat to be reckoned with, probably preferring to continue sunning itself on the granite slab it lay on than be chased into its burrow. The ground became more vibrant with a lusher carpet of green that became increasingly colored by a variety of flowers. A group of four young ladies resting near the upper lake were the first people I would come across in the basin. Their numbers would increase as I descended further, eventually totalling 30-40 for the afternoon.